Yannick Craigwell doesn’t need to guess how large the Canadian appetite will be for edible pot once it’s legal. He already knows that it’s huge. “Once it becomes legal, I think the only thing that’s going to change is you’re going to get the people who were raised to think ... ‘Weed is bad, it’s the devil’s lettuce,’ and they’re going to be open to trying,” he said. 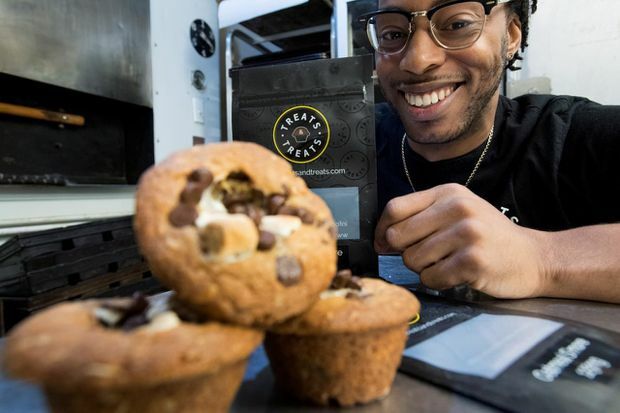 Yannick Craigwell shows off some of his edible marijuana baked treats in Vancouver. Canada’s cautious approach stands in contrast with Colorado, which had practically no restrictions when pot treats hit stores in 2014. The Rocky Mountain Poison and Drug Center received 87 marijuana exposure calls about children that year, nearly doubling the previous year’s total, although no children died. It’s illegal for anyone other than a licensed producer to sell medical pot, but Mr. Craigwell said he operates in the “grey.” He requires online buyers to agree to terms and conditions that state they need cannabis for medical reasons and he also sells his edibles in dispensaries in Vancouver, where police have chosen not to crack down. A standard dose of THC in Colorado is 10 mg, but Mr. Craigwell’s goodies range from 90 mg to 175 mg. He said he’s open to the government mandating a lower dose, but it should consider what customers want. Mr. Craigwell advised first-timers to eat a small piece and wait to feel the effects. “We found that it was really a product category – baked goods, chocolate, candy, beverages, honey, (ice pops) — that is much more accessible,” she said. The Coca-Cola Company has reportedly been in talks with Aurora Cannabis Inc. about beverages containing a non-psychoactive pot component. Molson Coors Canada teamed up with HEXO Corp. to sell marijuana-infused drinks, while Constellation Brands Inc., which makes Corona beer, invested $5-billion in Canopy Growth Corp.
Bruce Linton, Canopy’s chief executive, noted it’s already common to socialize over a beverage. Canopy has developed calorie-free drinks that deliver a high within seven to 12 minutes, rather than the usual delayed onset of an edible, Mr. Linton added. But Mr. Wendschuh said developing a product prior to its legalization has its challenges. He can’t currently taste-test the beers in this country.